spillyjane knits: No More Boring Knits! I finished the massive (and extremely cozy) Gandeymitts last night. They're for Tom, of course. Now I just have to line them so I can send them on their way. I'll be releasing the pattern shortly - you are only a scant three balls of Brooklyn Tweed SHELTER away from a pair of these. No more boring knits for men - so says I; so it shall be! December 20, 2011 at 2:58 p.m.
December 21, 2011 at 12:19 p.m. I like how the two sides have different patterns! Great for men indeed! December 23, 2011 at 10:36 p.m.
Lovely mittens! Just curious, how do you go about lining the mittens? December 27, 2011 at 2:50 p.m.
oh. i think i kinda need these in my life. 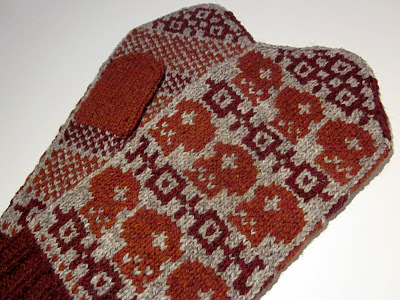 December 28, 2011 at 11:39 p.m.
Ooh I would love to know how you like to line your mittens? January 4, 2012 at 10:47 a.m.